Defender Jimmy Dunne scored on his Clarets debut in a 1-0 win over Cork City at Turners Cross. The Republic of Ireland under 21 international opened his account for the Clarets in the 71st minute, tapping home from close range after James Tarkowski's header from Ashley Westwood's corner fell in to his path. The 20-year-old, who started his career at St Kevin's Boys Club in Dublin, similarly to team-mates Robbie Brady and Jeff Hendrick, was introduced at half-time as boss Sean Dyche made wholesale changes. 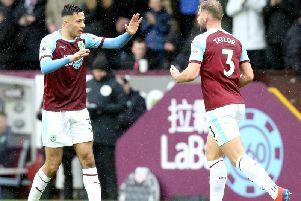 The former Manchester United youngster, who arrived at Turf Moor in 2016, enjoying spells on loan with Barrow and Accrington Stanley, was the unlikely hero with the likes of Stephen Ward, Jon Walters, Kevin Long, and the aforementioned Clarets duo, receiving all the attention before kick off in their homeland. It was the first run out for the squad following a training camp in Fota Island with Dyche looking to get minutes in to his players ahead of the Europa League second qualifying round tie with Aberdeen at Pittodrie later this month. Record signing Chris Wood hooked a volley in to goalkeeper Peter Cherrie in the first half before Kieran Sadlier fired in to the side-netting at the other end. Jack Cork, who didn't miss a minute in the Premier League last season, then missed the target from the edge of the penalty area on the half-hour mark. After Dyche rung the changes at the interval, with Aiden O'Neill the sole survivor from the first 45 minutes, it was the midfielder who threaded a dangerous cross in to the box only for Sam Vokes to poke wide at the back post. Cherrie kept out Vokes's powerful header as the visitors upped the ante and the goalkeeper came out on top again to repel O'Neill's effort from distance. The deadlock was broken with just under 20 minutes remaining. Westwood's out-swinging corner was won by Tarkowski and, when the centre back's header was blocked, Dunne turned the ball home. Burnley first half: Tom Heaton, Phil Bardsley, Kevin Long, Ben Mee, Stephen Ward, Dwight McNeil, Aiden O'Neill, Jack Cork, Aaron Lennon, Nahki Wells, Chris Wood. Burnley second half: Anders Lindegaard, Aiden O'Neill, James Tarkowski, Jimmy Dunne, Charlie Taylor, Jonathan Walters, Ashley Westwood, Jeff Hendrick, Dan Agyei, Ashley Barnes (Dwight McNeil 82), Sam Vokes.